Almost Home Overland Park corporate housing in this community has recently been renovated! Updates include wood burning fireplaces, black kitchen appliances, wood-look flooring, updated lighting, . . . 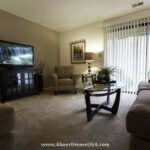 Almost Home Overland Park furnished apartments offer one, two and three apartment homes. Each apartment may include spacious closets, ceiling fans, washer and dryers, fireplaces, . . . Almost Home offers a wide variety of Kansas City, KS corporate housing options for every short or long term furnished apartment need you may have. Contact us today to receive a temporary housing quote customized just for you in your desired area of the city. Those staying in corporate housing in Kansas City, KS for business reasons might appreciate some information about the city’s business environment. Kansas City is a robust and rapidly growing economy exhibiting strong job growth, which is among some of the highest in the state. It is currently home to the General Motors' Fairfax Assembly plant, among other industrial plants. Cost of living in this town is lower than in most places across the US. Kansas City is also home to the University of Kansas Hospital, Medical Center as well as the Kansas City Community College. There are a number of other retail stores that maintain their regional center in Kansas City. Village West is an area located on the intersection of I 70 and I 435 where the Hollywood Casino, The Legends at Village West, Kansas City T-Bones and other major outlets are set up. It was set up as part of Kansas City's revitalizing move. Kansas City is ranked in the top 10 for cities that recovered after the 2008 financial crisis. Knowing what clothing to bring with you to your Kansas City, KS furnished apartment is somewhat dependent on the local climate. The climate in Kansas City is warm in the summer, reaching a high of 90°F in July. Summer temperatures vary between 70 and 90, then taper off to a cooler 55 to 70 degrees in the fall. Winter stretches between December and February with the highs barely in the 40s but the lows dipping to as low as 22°F in January. Snowfall is highest in January. So, be sure to dress right and then venture out of your Kansas City, KS corporate apartment to enjoy the wide variety of outdoor activities that this area offers. Being a temporary resident in Kansas City, KS corporate housing need not relegate you to feeling like a complete outsider. Acquaint yourself with Kansas City’s history by reading our brief historical summary provided below. There are two sides to Kansas City. The Eastern half is on the Missouri side while the western half is on the Kansas side. The Kansas side is the third largest among the cities in Kansas. Kansas City sits at the confluence of the Kansas and Missouri Rivers -- the same spot where Lewis and Clark set up camp on their exploration. P.F Chang's on W 47th St.: The Dynamite Shrimp is a good starter, followed by the Tuna Tataki or the Northern Style Spare Ribs or even Orange Peel Beef. As for seafood, the Oolong Chilean Sea Bass is a local favorite. The Cheesecake Factory on Wyandotte St: There are numerous flavors of cheesecakes that accompany a full menu, pizzas that are outrageously mouthwatering; and steaks that are scintillating. Whatever guests order here, they always end with a cheesecake. Swagat Fine Indian Cuisine on NW 87th St.: Indian food certainly does take some getting used to. Try the Butter Naan, it's mild, and the tangy sauce that comes with it will present an interesting experience. The Spicy Chicken is unique in flavor, and the appetizers present an opportunity to sample the variety of Indian tastes. Thai Place on Pennsylvania Ave.: This is a good place in town to get Asian food, especially, Thai food. The Thai chefs here balance their tastes perfectly. Take the Kang Panang, it's got the spicy gravy with red chilies, the sour of the lime, the sweet of the basil and the intoxication of the coconut cream, all bubbling with your choice of chicken, beef or pork. Woodyard Bar-B-Que on Merriam Lane: This place is all about BBQ. There are long lines here on the weekends and holidays, and with good reason. The outdoor patio set-up is awesome. From Chilli Topped with Burnt Ends to the Pecan Smoked Salmon Sandwich, the food is extravagantly delicious, but priced just right. The Pulled Pork and Smoked Sausages are tantalizing and done to perfection. Stepping out of your Kansas City, KS temporary housing is bound to present you with numerous interesting activities. We have listed a few possible entertainment options that may appeal to you. Museums: The Strawberry Hill Museum on North 4th St. will give you a glimpse into the background of the Kansas City area. Beginning with is tribal heritage to its contemporary heritage. Even the history of immigrants, an important part of Kansas City, is on display. There are occasional special exhibits that feature international events and people. Performing Arts Theaters: The Kansas City Repertory Theatre on Cherry St. is the local favorite and the professional theater that has major shows on stage though the year. From the holiday season in the winter showcasing seasonal favorites like the Christmas Carol to Shakespeare classics like Romeo and Juliet. Malls: Kansas City has the Legends Outlet Mall, located on Village West Parkway. This outlet mall is extensive in its offerings with shops covering a wide gamut of merchants from Women's Fashion to Entertainment, Home Furnishings and Shoes, among others. Some of the brands you will find here include Ann Taylor, Adidas, Cole Haan, and even Movie theaters like Legends Theaters, and entertainment like Dave and Busters. Golf: The Painted Hills Golf Course on Parallel Pkwy is a favorite among locals. It's an 18-hole course cut onto rolling that is characteristic of Kansas. The gentle rolls presents challenges for for many. The greens are covered with bent grass making the Par 71 course challenging. Painted Hills opened in 1929. Parks and Recreation: The City offers well managed parks and facilities in the area. Once such park is the Wyandotte County Lake Park on Leavenworth Rd. The park covers 1500 acres including a 400 acre lake where park visitors are allowed to boat and fish. There are also playgrounds, shelters and boats available for rental. Pontoon docks are also available. Wyandotte County Parks and Recreation Department has all the information. Whatever your reason for visiting Kansas City, Almost Home Corporate Housing is your best choice to provide you with a furnished apartment in Kansas City, KS that is perfectly tailored to meet your unique housing needs. Call us today to receive a quote or fill out our simple housing request form at the top of this page.